Welcome Aboard the Art Newsletter! It's official! The Drizzlescapes are a hit! 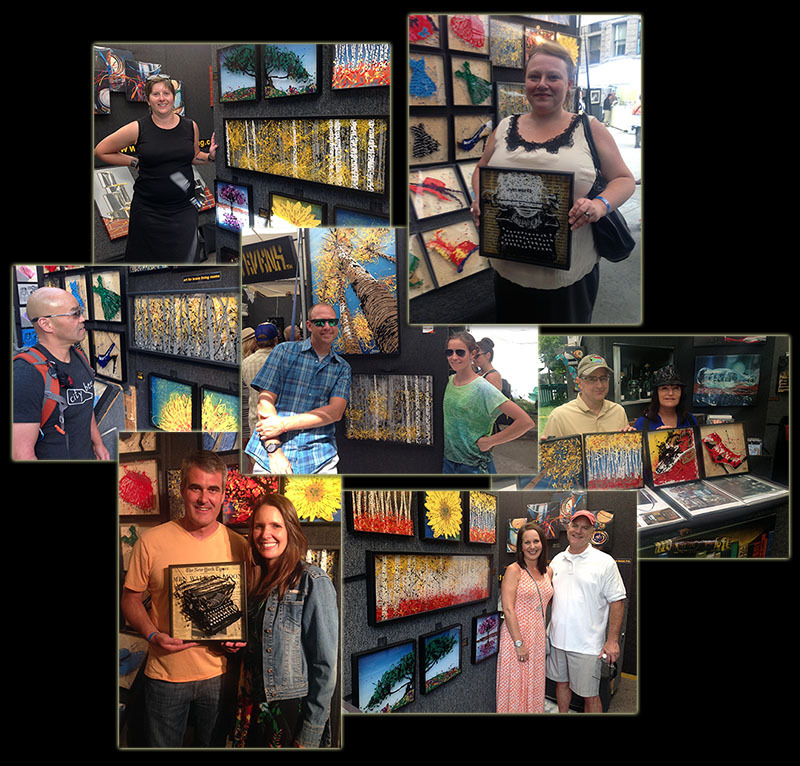 Below is a collage of just a few of the collectors who've acquired Drizzlescapes this summer. Here are the latest Drizzlescapes splattered, dribbled and sprayed this summer! 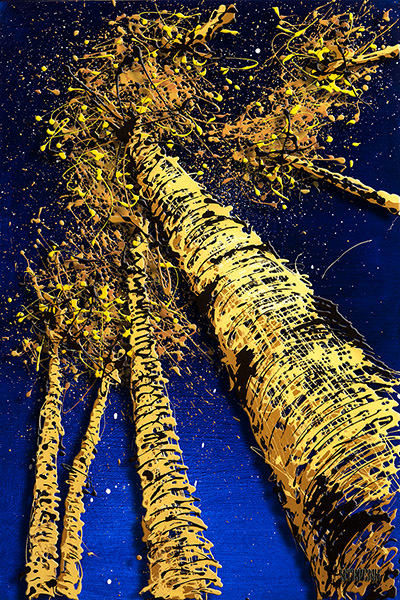 (right) - "Aspen Night Sky" - 36"x24" acrylic and enamel on TWO layers of plexiglass and a wood panel separated by a 5/8" spacer in a custom black frame. 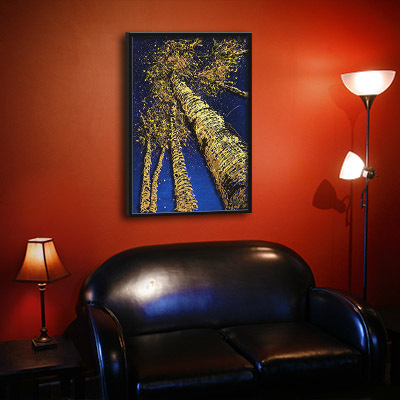 Below is a sample image of the "Aspen Night Sky" hanging in my den at the Casa de Stevens, just to give you an idea of scale and such. 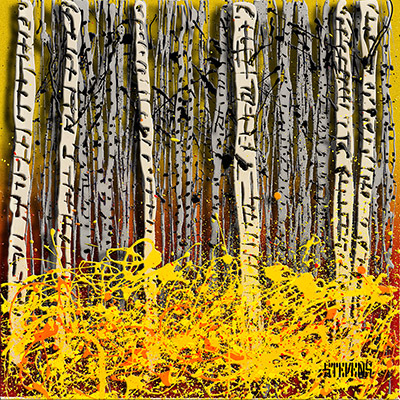 (above) - "Panoraspens 04"; Another in the 12" tall by 36" wide triple layered panoramic aspen paintings! I can't wait to get back in the studio and do more of them! (below left and right) These are both 12"x12" Aspen Drizzlescapes, consisting of enamel on two layers of plexiglass, suspended in contemporary metal frames over painted backgrounds. (way down yonder) - "Fall Panoraspens"; 12"x36" My first go at bringing in the fall colors on one of the panoraspens. 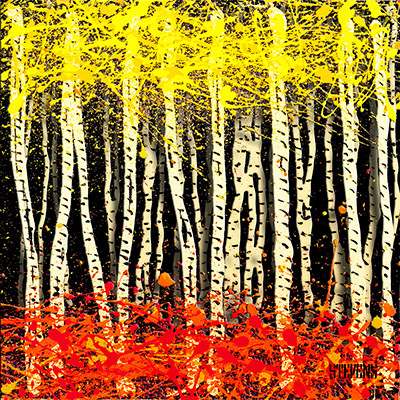 White tree trunks and vibrant fall leaves dance all over multiple layers of clear acrylic and a bright background!. Thanks for helping make this a fantastic year! I'll be sending out another newsletter very soon with some exciting news as I head into fall. In the meantime, if you see any art you just can't live without, be it the new Drizzlescapes, a mixed-media typewriter sculpture, or one of my reknown photo-realism paintings, just toss me a note! And remember, I'm happy to work out payments you can afford, and I never charge anything extra for it!